Good day today since the much anticipated Deep Purple release “Long Beach 1976” (part of the ongoing Deep Purple Overseas Live Series) arrived in the mail. I went for both options, the Two CD and the Three Vinyl editions will both find a home where I dwell. Now this has been released a few times before so there is not much to speak of here except the fact that it is really nice to get this recording on full vinyl after all these years. That is obviously a first. Secondly, as far as live albums goes this one is exceptionally great, like “Made In Japan” and “Made In Europe”. It just proves that Tommy Bolin was a great player in Deep Purple and that it worked. It was the darker side of the story (recently blogged about in detail on this blog) that ended it all. But musically, man was it something else! 1970s Purple was astounding, always walking tall and certainly great to the very end. The local water system in my neck of the woods has been contaminated in one way or another and since yesterday the local authorities says that the tap water needs to be boiled before used. It may not be all that bad this time around, but a few years ago there were real problems that resulted in thousands of people (I was one of them) getting sick. So it may be the case that local authorities are taking no chances whatsoever this time around. In any case, I was ready for this and it doesn´t take much to be prepared. So here is a small suggestion, something that preppers know very well but since we have new interest in this right now here it comes. You can save water for five to six months in your refridgerator and it will be OK. This comes directly from the homepage of the Civil Defense, and they ought to know. In fact, they urge people to be prepared for things like this. Right now, people are buying water like crazy in the stores, good luck in finding some now a few hours after the daily deliveries, but at least we have a system that works right now. At some point, it might be the system in itself that struggles. In other words, storing up on some drinking water is a very good idea. Yesterday, I was in a position to help a friend out. Being prepared for things like this is not a bad thing. I tried out powdered milk a while back and it tasted good. The advantage is that you can buy a few packages that weighs next to nothing and they will last for a few months before they go bad. To get your milk, you just add some water and that is it. I think this is a good suggestion for preppers as well and that is why I mention this on the blog. 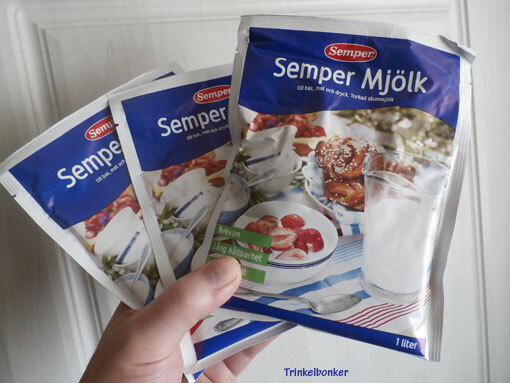 Seen here is a few packages from Swedish manufacturer Semper.